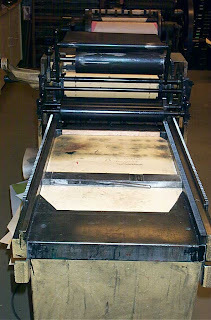 The first bookbinding course that I took, was at the Dawson Printshop. At that time, it was located in the Killam Library at Dalhousie University. 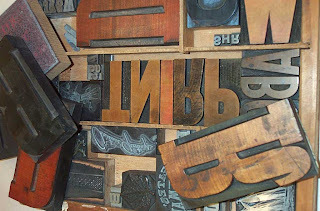 There was a bindery room set up for classes, but primarily it was full of antique printing equipment with over 1000 cases of wood and metal type. I was reminded of my time at the Dawson Print Shop recently becuase I am running low on hard drive space. I suppose I should explain that a bit better. While I was at Dalhousie and taking bookbinding classes at night, I was more officially a student at the School of Information Management. One of the projects I worked on as a graduate research assistant, was the History of the Book in Canada project. Specifically, I was the computer nerd making the databases work for the HBIC Electronic Resources component of the project. (And just having visited the website, it appears the database search interface isn't working...is it possible that Lasso is not compatible with new browsers? what a shock!) So, anything computer-related or website-related was handed to me. During the development of the project website, I was given a key to the Dawson Printshop and sent off to take photographs of the equipment so that we might use them on the website. So, I was alone in the print shop with a camera, poking around taking pictures! 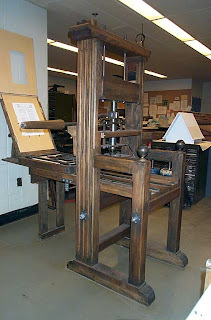 This is a replica of a 17th century Plantin-Moretus common press. So recently when my C drive complained about being low on free space, I went through some old folders looking for stuff I could delete since I tend to save everything. One of the things I found, was a folder containing some of the photographs that I took that afternoon. The Dawson Printshop has been moved to the Nova Scotia College of Art and Design. I have been to visit since the move and the new space is much more vibrant compared to the no-window zone of the Killam Library. I discovered some photos of the new Dawson Room, on Nik's blog, who has been fortunate to work and study there. Looking for Folder Printing? PrintingBlue offers Online Folder Printing Services, Business Folders, Vinyl Folders, Custom Folders, Pocket Folder Printing and more.